I really don’t understand all the dislike for the Return Of Marvel Legends Wave Two Drax on the collector forums. I think he turned out pretty well and that he looks almost exactly like he’s being drawn in the comics now. 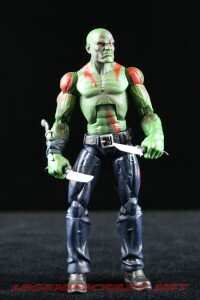 I admit when I first saw him in the package, I thought; “Meh, I could have done without this one.” I have to say now though, that he kind of grows on you. Would I liked to have a classic version instead, sure. 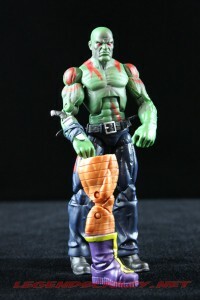 I hope that sometime down the road Hasbro will give us that one too, but I think after you get him out of the package and add him to your cosmic characters display, you’ll decide he’s not so bad after all too. He definitely seems to be one of the peg-warmers where I hunt though. 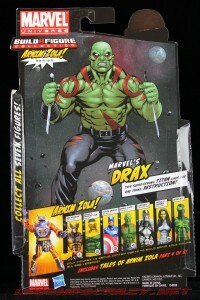 My introduction to Drax the Destroyer came during Marvel Comics Infinity Gauntlet storyline. I became a big fan of Adam Warlock after reading that and all the cosmic characters from that time period. Drax has gone through a few changes since those days. 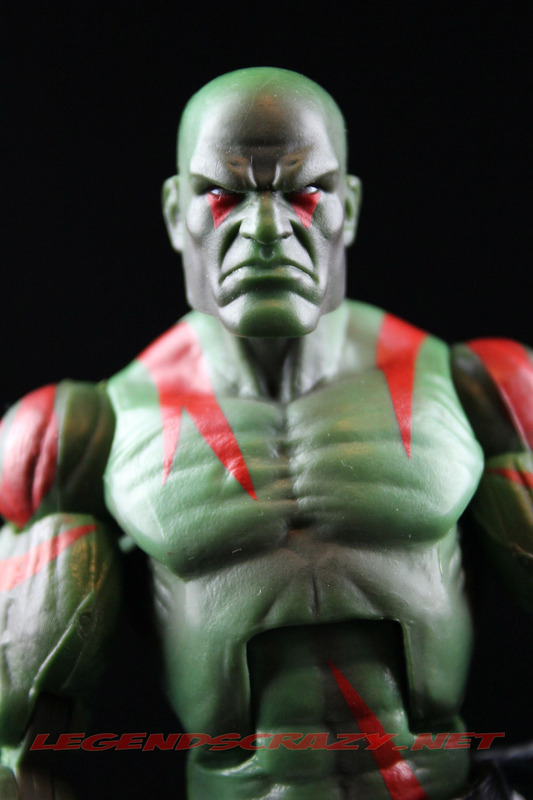 He’s lost his family to Thanos, was killed by Moondragon, was resurrected and suffered brain damage as a result that, been a member of several different teams, and has seen a resurgence in the comics since the Annihilation storyline. 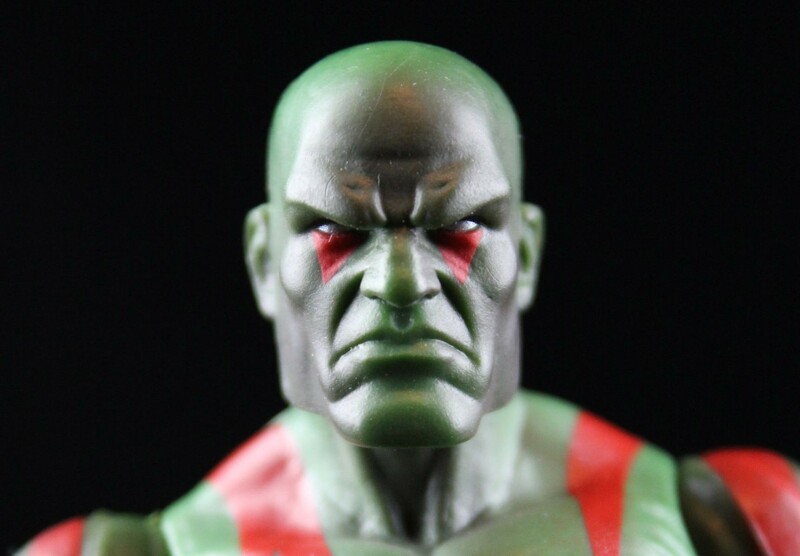 The head-sculpt is very well done, at a glance you can say, yes he’s angry. 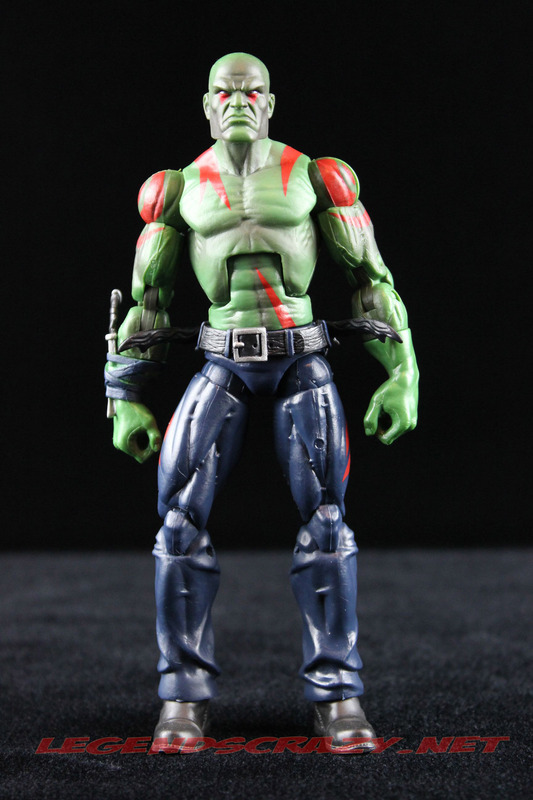 There is some light black airbrushing in the face area and all the upper body, which gives a nice shadow effect. 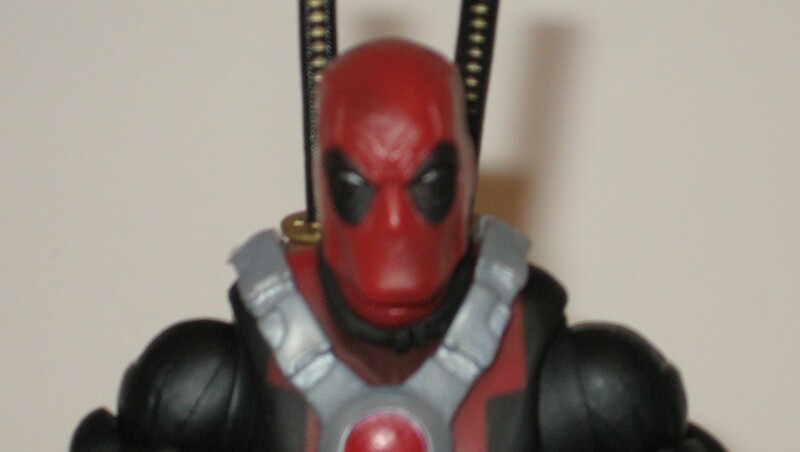 The eyes are white and pupil-less with red triangles painted on just below the lower eyelids. 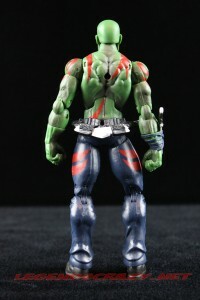 He also has a red tribal-like tattoo on his chest, back, shoulders and biceps. The red against the green of his body gives him a nice little pop. He comes with two knives that you can place in the sheaths on the back of his belt and one that is permanently attached to his wrist. it would have been nice if that one was also removable, but it does add some detail to a pretty plain bare-chested figure. 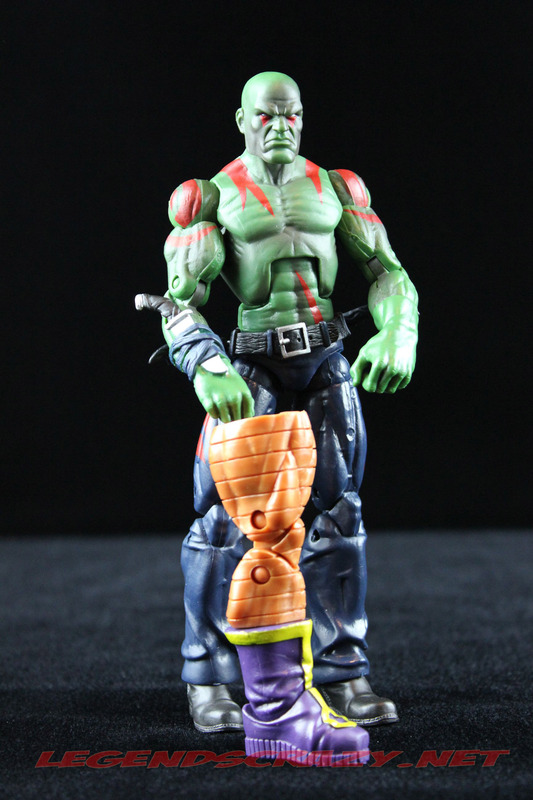 the belt on Drax is once again not glued to the waist and has a peg-latch so it can be removed. 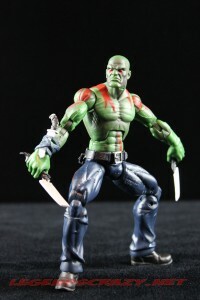 I’m pretty sure the lower body is a new sculpt, so they must have some other characters in mind to use this for down the line (Modern Luke Cage?) 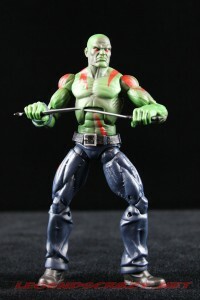 but, the upper body is from the Nick Fury/SHIELD Agent. 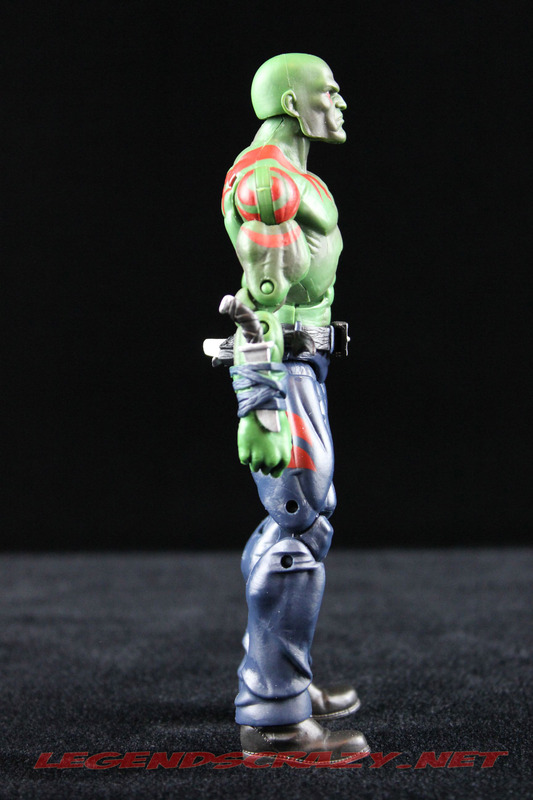 The head has a hinged ball-joint, ball-jointed shoulders and hips and double-pinned elbows and knees. 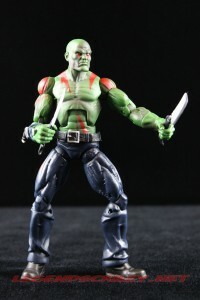 There is a mid-forearm cut but no articulation in the wrists. 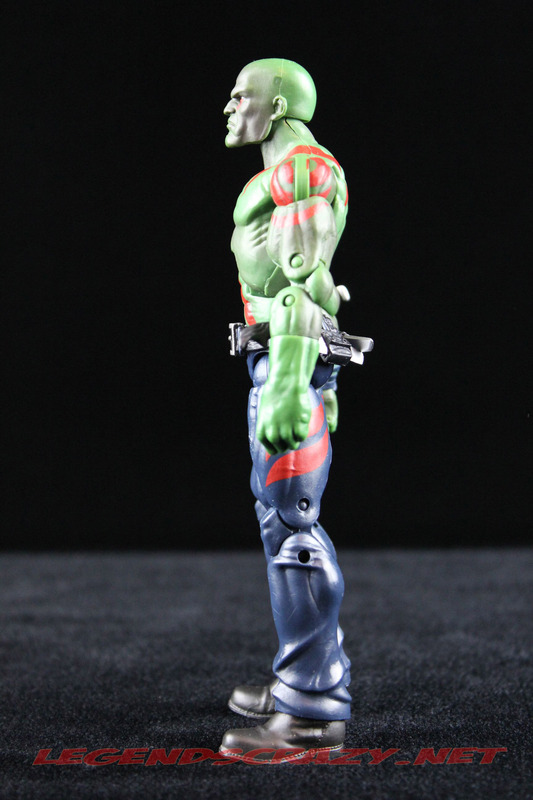 He has an ab-crunch, a cut waist and pinned swivel feet. The hinges used for the knees are made of a softer plastic, so there was some warping from the pose in package. The hip ball-joints on my figure are also a bit to lose for my tastes. He is pretty poseable except for his wrists and feet. 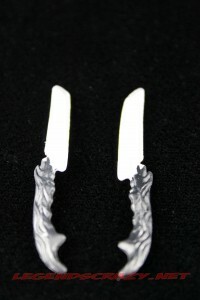 The feet have limited movement upwards because of the sculpt of the pants. 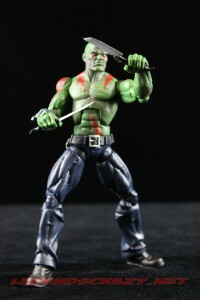 It’s also a tad hard to get his knives into his hands because of the flare at the hilt of the knives. The hands are probably my biggest beef with this figure. I like for my figures that use weapons to have wrist articulation. Wrist articulation probably wouldn’t have worked very well on right hand anyway though, because of the knife molded to that arm. 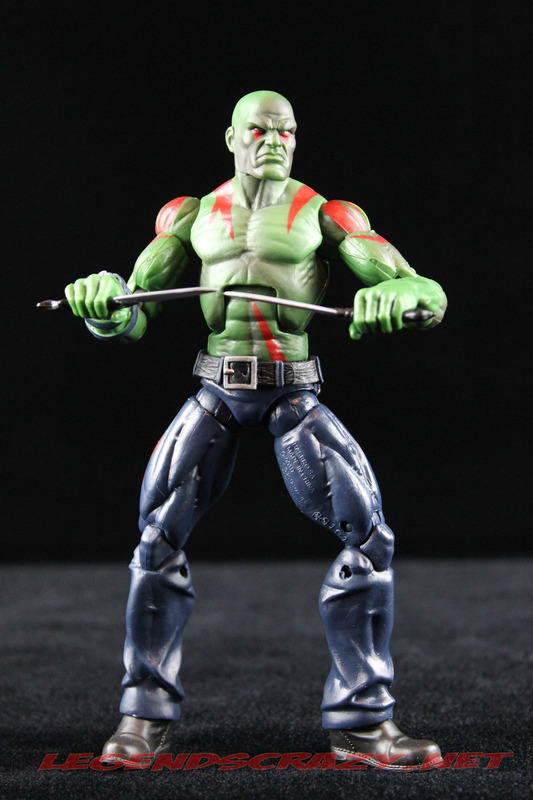 Drax comes with the left leg which you will need for your Arnim Zola Build-a-Figure. 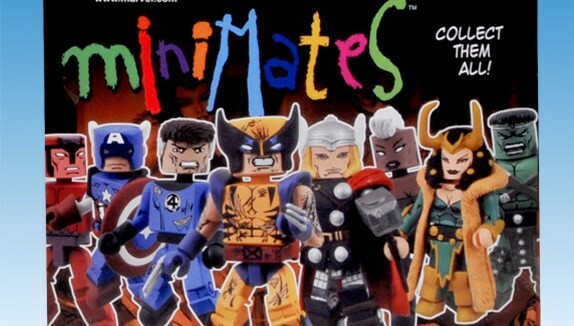 Hasbro has done a nice job with giving us some cosmic characters in the Marvel Universe line and I hope that they will do many for the Marvel Legends scale as well. 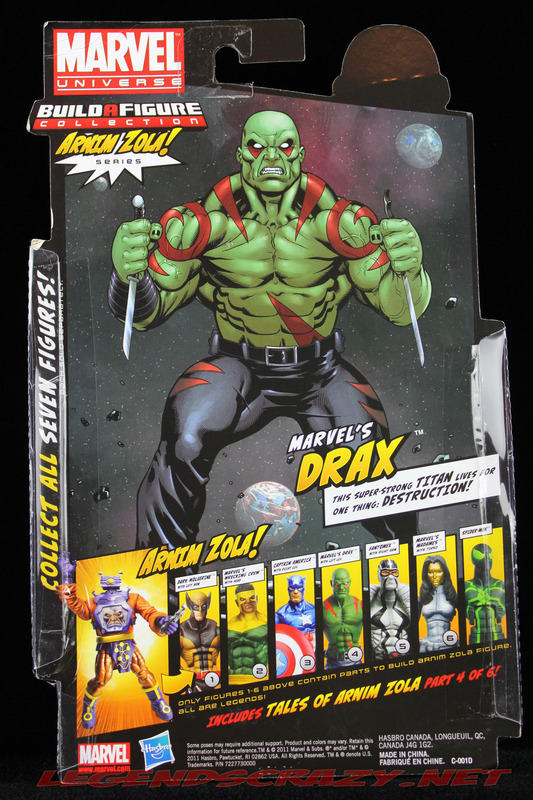 I would love to have classic versions of Adam Warlock, Gamora, Moonstone, Pip the Troll, Thanos and the Guardians of the Galaxy. Tomorrow we’ll have a look at Fantomex. Until then; did you pick up Drax? What do you think? Love him or hate him? Let me know in the comments. 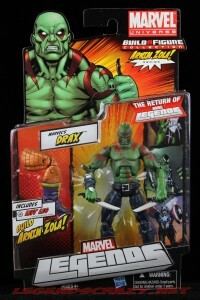 The Drax figure for this review was sent to me by the wonderful team at the Enchanted Toy Chest.